As one of the freest economy in the world, Hong Kong is renowned for being a unique commercial hub for setting up new business entities. Due to its proximity to China, its similarities regarding social customs, language, culture and its international business environment, it is an ideal place for foreign investors to enter the Chinese market. So if you’re considering forming a new company in Hong Kong, you may be filled with questions, such as how hard the company formation process is in Hong Kong. Registering a Hong Kong company is the first step of doing business in a free economy like Hong Kong, and the basis for running a business. A Hong Kong private company limited by shares is the dominant type of business in Hong Kong, and it counts for approximately 99% of all the companies incorporated in Hong Kong. The rationale behind this trend is that limited liability companies have a strong public perception, separate legal personality, and a limited liability for its owners. In fact, the process of transferring ownership and raising capital is more manageable than the other types of business structures, such as a sole proprietorship. Of all the advantages offered by a private limited company by shares, most foreign business professionals often prefer this type of entity for their companies in Hong Kong. The process of registering a limited liability company is straight-forward, and it is not restricted to local or overseas nationals. The Companies Ordinance of Hong Kong governs incorporation and any person, whether they are foreign or local, can set up a Hong Kong company. However, they must be above the age of 18. It is strongly advised to engage the services of a professional firm whether you are a foreign or local entrepreneur in order to complete all the ongoing regulatory and compliance requirements. This article will provide you with a brief introduction about registering a private limited liability company in Hong Kong including the criteria for basic incorporation requirements and also the post-incorporation process. Below are some of the basic requirements and facts that you should know before incorporating your business in Hong Kong. A Hong Kong company may either have a Traditional Chinese Name or an English Name or can be the combination of both. But combining English and Chinese characters are not allowed. For a Limited Company, the character “有限公司” and the word “Limited” must be the last word in the Chinese and English language. The word “Limited” will be allocated after The Company Registry approval of your company name. The shareholders are those members that initiate the incorporation process of a company. In Hong Kong, a private limited company can appoint a minimum of 1 and maximum of 50 shareholders in their business entity. 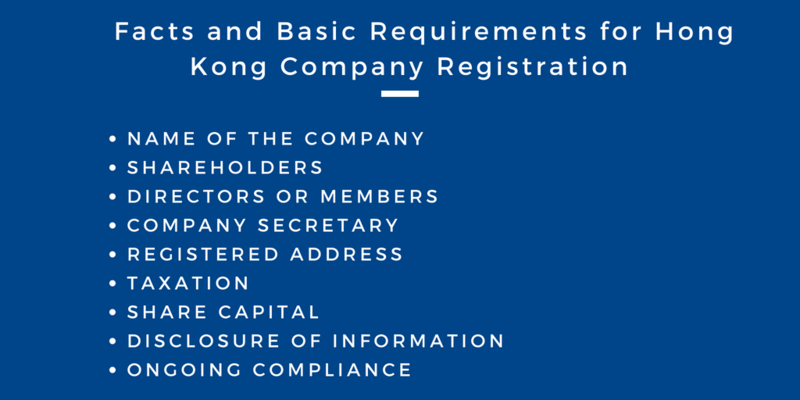 The best part about the Hong Kong company registration is that there are no residency and nationality requirements for shareholders. In fact, a director and shareholder can be the same person in the business venture. However a shareholder must be at least 18 years of age. Both an individual or a company (body corporate) may become a shareholder as well. You can also appoint non-executive shareholders in Hong Kong. There is no restriction for the meeting place of shareholders, you can hold it anywhere in the world as per your requirements. A Hong Kong private limited company by shares can have corporate body directors or an individual, but it must have at least one individual director. The directors have the responsibility of ensuring that the company is complying with legal obligations at all times. A minimum of one director and no limit on the maximum number of directors can be allowed while operating your business in Hong Kong. An individual director can be either a resident of Hong Kong or a foreigner, but they must be over the age of 18. There is no requirement for the directors to be shareholders; they can be different in a company. You can also appoint non-executive directors for the Hong Kong company if you needed. In order to complete your Hong Kong company registration, appointing a company secretary is mandatory for all business entities. If you are selecting an individual for your secretary position, then they must ordinarily reside in Hong Kong; or if it is a body corporate, then it must have a place of business in Hong Kong or a registered office. In the case of shareholders and directors, the same person cannot be appointed as the company secretary in the company. The company secretary is solely responsible for maintaining the records of the company, updating statutory books and must also ensure the company’s compliance with all statutory requirements. Moreover, the founder members or the shareholders should employ a professional company secretary firm in Hong Kong to be the Company Secretary, or nominate a nominee to act as the position. The next requirement for Hong Kong company registration is that you must provide a local Hong Kong address as the registered address of the company. The registered address must be a physical address and cannot be a PO Box as government letters will be sent there for communication with the company. The intended purpose of this registered address is not limited, it can also be used as the residential, commercial or industrial address. But the registered address must be able to be reached by local postal service for government communication such as Annual Return and annual Tax Return is sent to this address. Taxes are the primary reason for any entrepreneur who intends to register their business in a given jurisdiction. In this regard, Hong Kong boasts being one of the lowest tax jurisdictions in the world. Profits tax or Corporate tax is taxed at 16.5% of assessable profits for companies set up in Hong Kong. Personal income tax which is also known as salary tax starts at 2% and goes up to 17% for income above HKD 132,000. As a matter of the fact, Hong Kong follows a territorial basis of taxation. It means that only profits which arise in or derived from Hong Kong are subject to tax in Hong Kong. There is no withholding tax on dividends, capital gains tax, or GST and VAT in Hong Kong. In Hong Kong, there are two types of share capital: authorized share capital and issued share capital. Authorized share capital represents the total amount of shares in the company. Although there is no minimum requirement for the share capital for the Hong Kong company registration process, startups incorporated in Hong Kong should have at least one shareholder with one ordinary share issued at their formation. Share capital can be expressed in any significant currency, and it is not restricted to Hong Kong Dollars. Shares can be freely transferred to anyone, subject to a stamp duty fee. Bearer shares are not allowed. Once the company is incorporated, it needs to file the details of the company officers with the Hong Kong Company Registry. However, if you wish to maintain confidentiality for your venture, you can nominate an individual director or corporate shareholder by utilizing the services of a professional services firm. However, the government may demand the Significant Controllers Register for inspection. Under the Company Ordinance of Hong Kong, it is mandatory for business entities to prepare and maintain financial records. In fact, the balance sheet for the Limited Company must be audited by a Hong Kong CPA and must be present to the shareholders in general meeting within 18 months after incorporation of the entity, and then at least once in every calendar year. Limited companies are required to file annual returns (NAR), regarding the particulars about the company officers with the Companies Registry and pay a yearly registration fee. The Business Registration Certificate (BRC) should be renewed one month before expiry on an annual basis or once every three years. An Annual General Meeting (AGM) of the shareholders should be held within 18 months after the Hong Kong company registration, and then at least once in every calendar year but not later than 15 months after the last annual general meeting for your business. If you are a foreign business professional who is ready to register an offshore limited liability company in Hong Kong, then you must take into consideration the following points for the registration of your business entity. Foreigners are not required to be physically present at the time of company registration, but physical presence may be needed to open a bank account. This would depend upon the requirements of your chosen bank. Foreigners who are not ready to relocate to Hong Kong are free to operate their company from outside of Hong Kong. Foreigners are free to be the shareholders and sole directors of a Hong Kong company.There are no local resident requirements. 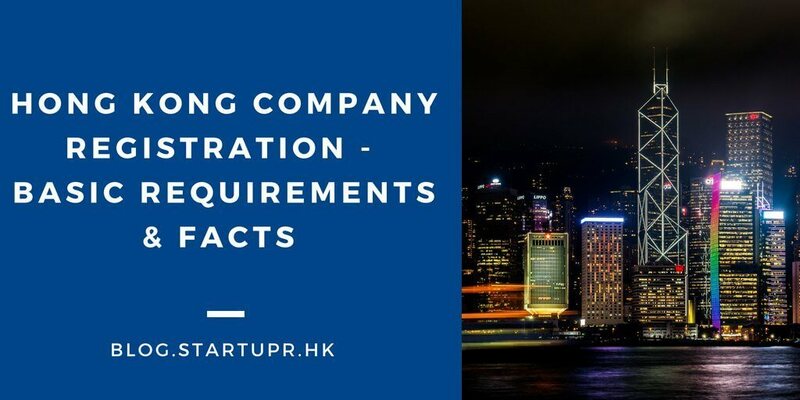 Under the Companies Ordinance, a non-Hong Kong company must complete registration within one month after establishing its place of business in Hong Kong. It must also submit the following documents to the Registrar of Companies. Certified copy of the Articles of Association for the company and a standard document which is typically provided by a professional services firm assisting with the incorporation of your business entity. For non-resident directors and shareholders, a copy of passport and overseas residential address proof is a must. For the Hong Kong resident directors and shareholders, a copy of residential address proof and Hong Kong identity. For corporate shareholders and directors, a certified true copy of the parent company registration documents such as Article of Association and Certificate of Incorporation is a must. Are you interested in incorporating your business in Hong Kong? Well, you can hire a professional services firm like Startupr that will help you in your company formation, and take care of all the necessary formalities from the beginning to end. Hiring a competent and service-oriented firm is very important for long-term success in Hong Kong. The firm you hire will complete the following tasks for your business entity. Preparing the documents for the new company such as statutory records, share certificate, share register and registered office address. Collecting the necessary incorporation details and identifications documents from you. File the incorporation documents with the Company Registrar and obtain a Certificate of Incorporation. Check the company name of your choice and prepare the necessary incorporation documents including Articles of Association that will need to be filed with Company Registrar. Obtain Business Registration Certificate from the Inland Revenue Authority. Assist with filing for business licenses, ongoing regulatory compliance, and annual filings as appropriate. Also assist the client with the application of opening a bank account, if needed. Hong Kong is considered one of the best cities to establish and run a business, scoring high on factors that matter to businesses. So, if you are planning to start a business in Hong Kong, you would need help in incorporating and registering your business. Startupr can help you with it. Contact us for more details and complete your Hong Kong company registration with ease!